While most of us are used to left-to-right text, menus, and whatnot, there are certainly users who’d prefer their smartphone or tablet to have right-to-left layouts. Of course, if your device’s system language is one that uses a right-to-left script (like Arabic, or Hebrew), the change from LTR to RTL is done automatically. However, Android allows you to force RTL layouts even when using a left-to-right language. This should be helpful for left-handed people, in case they find the regular LTR layout too cumbersome. To force right-to-left layouts on your Android device you need to open Settings, and access the Developer options menu (if developer options aren’t enabled, here’s how to do it). Once you’ve accessed the menu, scroll down to find the “Force RTL layout direction” tab. Tap on it to activate the option, and you’re done. All system menus and Google apps will reflect the change: phonebook, messaging, Google Play, Gmail, notifications area, and so on. Switching back to left-to-right layouts is just as easy, and is obviously done by taping again on the “Force RTL layout direction” tab. As you can see below, our quick tutorial was done using stock Android Lollipop (5.0.1), but you should be able to force RTL layouts on any device running Android 4.2 or later. See? Everything's different (as in mirrored) now. There's more in the following screenshots. You can switch from LTR to RTL with just a tap. 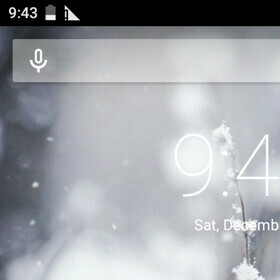 Changes are visible even on the lock screen. I'm left handed and I see no problems with the current layout, tbh. I am too and sometimes it hard to reach right buttons with thumb. I'm gonna give it a try. Kind of funny to switch another's phone to this when they're now aware. What's funnier is to turn on "show layout boundaries," “screen updates," and “show cpu usage." If it's a regular user that doesn't know anything about developer settings, they'll freak out and think their phone is broken. I am left-handed and I find this useless. because most lefty just adapt? just like left handed person play regular guitar no problem. Tried it. Its neat! Gave me a head ache tho.